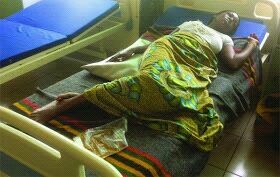 Welcome To Brown Empressblog: Youth Corper crippled by Camp Commandant. base of the spinal column . 11 boys and four girls. same room with the boys. there was no vacant room. know why he pushed me. push his sister like that. pushed me to the wall. would refer her to Enugu. could not handle it too.